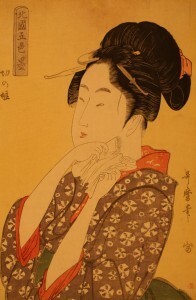 From the work of Kitagawa Utamaro, the leading artist of bijin-ga (portraits of beautiful women): “Kiri no Musume”. A green obi on a crushed yellow background, a red undergarment, and a purple tie-dyed kimono. This is the only colouring of its kind in the world, a gem of the museum’s collection. Successful during the height of ukiyo-e, producing a wide diversity of pictures in a variety of genres: Ichiyusai Kuniyoshi. 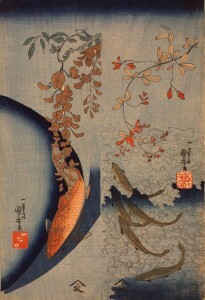 Two works, strips of fancy paper left uncut: Kuniyoshi’s “Higoi ni Fuji” and “Hagi ni Ayu”.